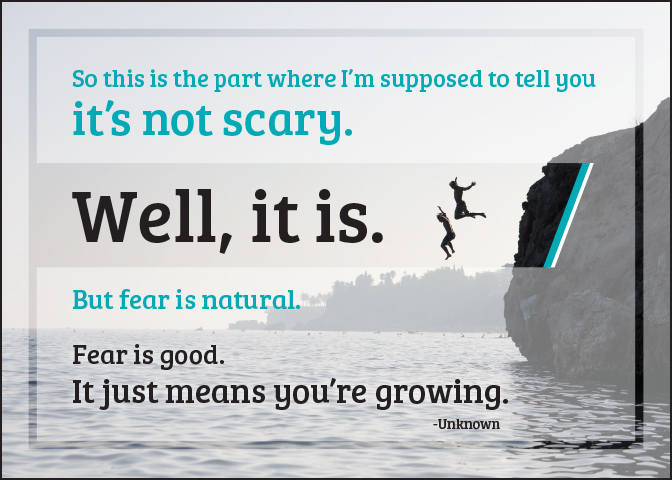 Fear doesn’t feel good, but I do believe it’s natural and means we’re growing. Katie Ferguson did the graphic design for this quote to go along with her Feel the Fear and Do it Anyway story and Power in the Positive tip. In May, my daughter, Katie had her hands full as she cared for me and her dad. I’m thrilled she accepted to be today’s guest author. 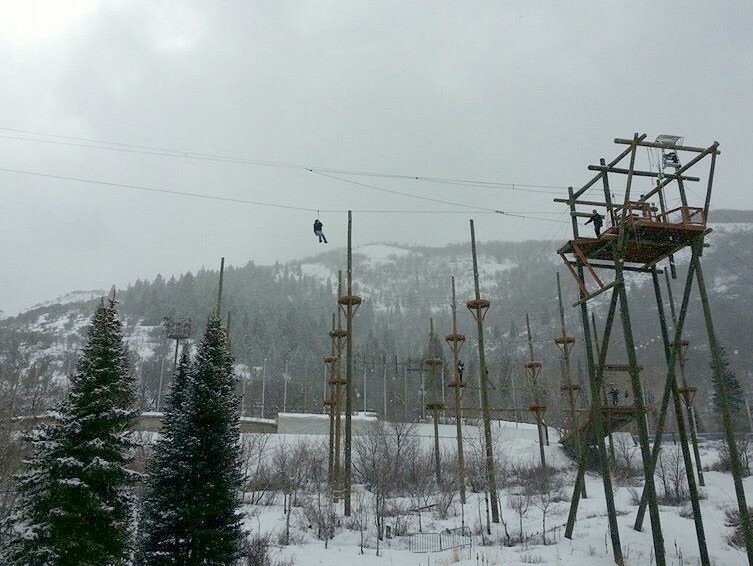 My recent caregiving experience reminded me of a chilly afternoon on March 1, 2015 when I stood on top of a 65-foot high tower in Park City, Utah. The mountain air smelled fresh. Some of the snow from the previous day’s storm was melting. The view was gorgeous. With my helmet on, I was strapped into a harness clipped onto a 377-foot long rope. Just one step off the platform and I’d be zip lining above the treetops to the second tower. What if the rope breaks? I thought to myself. What if my harness comes undone? Feel the fear and do it anyway, I told myself as I stepped off the platform. I gasped and held my breath until I felt the rope catch my harness. I looked down to enjoy the mountain scenery as I glided above the pine trees. “It was scary!” I replied, knowing the scariest part was about to come. 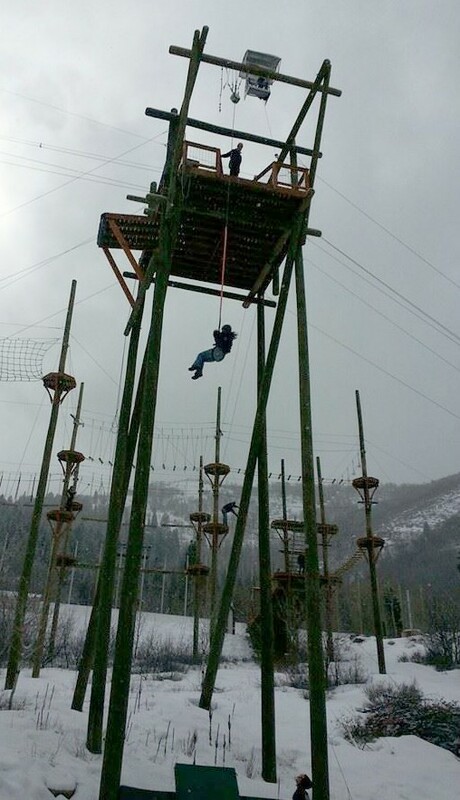 The only way down from the second tower was to step off the platform for a 65-foot vertical drop. “Just walk off the platform. Don’t run or jump off. If you’re scared, don’t look down,” he said as he fastened my harness to another rope. The rope went straight to the ground where another employee and my husband were waiting for me. Feel the fear and do it anyway, I reminded myself. I walked off the platform before I could talk myself out of taking the plunge. I heard screaming, then realized the racket was coming from my own mouth. 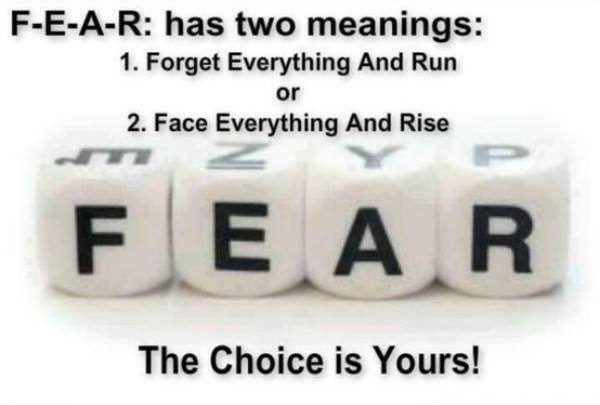 “Feel the fear and do it anyway,” is a saying I picked up at a personal development seminar several years ago. It’s also the title of a personal development book by Susan Jeffers, which I haven’t read yet. The statement reminds me it’s okay to feel scared, but it’s important to accomplish what I set out to do before I talk myself out of it. I’ve learned my confidence grows when I achieve goals that scare me. As I prove to myself I can accomplish an intimidating task, my comfort zone expands and I feel it’s possible to do even greater things. A of couple months after my zip lining adventure, I moved in with my parents for five weeks to take care of my dad while my mom recovered from hernia surgery. Because I’m a self-employed graphic designer, I had the ability to pack up my home office to work and live at my parents’ house. My husband and I decided it would be best for him to continue living at home with our dog during weekdays and they would stay with me at my parents’ house on the weekends. Shortly after making the commitment, my mind became consumed with fears. How will I stay on top of my work while caring for my dad? What if the experience creates friction in my marriage? What if it causes contention between my parents and me? My biggest worry was—What if I drop my dad while transferring him into his wheelchair or bed? Dropping my dad might seem like an unusual fear, but I felt it was well justified. In October of 2011, my dad fell off the side of his bed twisting his ankle, which resulted in a bad sprain and torn ligaments. My mom usually stands my dad up when she transfers him, but he couldn’t put weight on his injured ankle. It was difficult for my mom to take care of him, so I stayed with my parents a few days after the injury to help my mom. My dad is already prone to seizures, but his susceptibility heightens when anything else goes wrong in his body. Even when he catches a common cold he has more seizures. My dad had to endure the pain of his sprained ankle in 2011 and the additional seizures. I knew if I dropped and injured my dad it could cause him pain, which could cause him to have more seizures. I was worried I wouldn’t be able to care for him on my own. 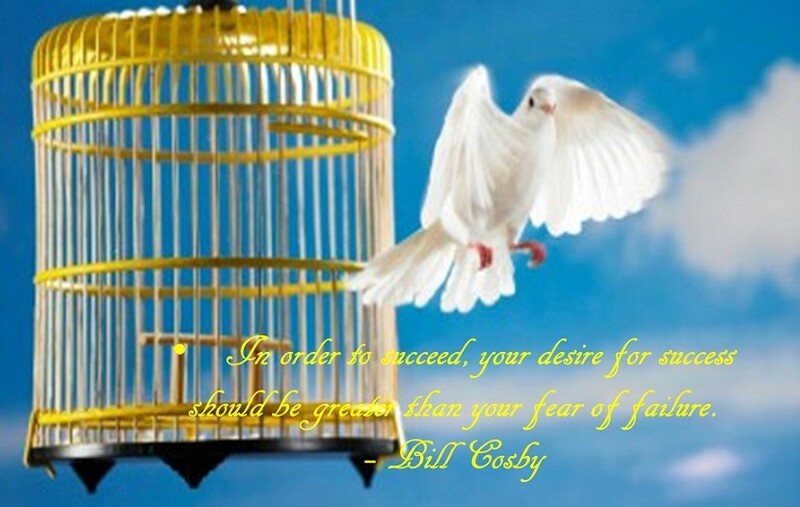 Being a spiritual and prayerful person, I took what I wrote and prayed for God to help me be successful. A couple days before my mom’s surgery, my husband and I went to my parents’ house to learn how to transfer my dad in and out of bed and to discuss his daily and weekly schedules of care. I helped my mom dress him many times while I was growing up. As children, my brother and I helped get my dad into our family car before we got a van with a wheelchair lift. I’d seen my mom transfer him hundreds of times. Because my dad is tall and stiff, I never wanted to transfer him by myself. My mom is stronger than the average woman and I didn’t think I had the physical strength to transfer him on my own. My mom gave my husband and I some pointers on how to successfully transfer him and then asked who wanted to practice first. Eager to get it over with, I volunteered. My dad leaned forward in his chair. I faced him, squatting to keep my back straight. I put my forearms under his armpits and my palms on his shoulder blades. His hands were on his armrests so he could push up. Feel the fear and do it anyway, I thought. “Okay Dad, ready? One, two, three.” I pulled my dad up as he pushed off his wheelchair to stand up. He and I pivoted his body so I could sit him on the side of his bed. We did it! I conquered the fear before I could talk myself out of it. My comfort zone expanded and I had more confidence to move into my parents’ house and put our plan in motion. Katie, I love you and this analogy, but you obviously didn’t get your sense of adventure from me. Just looking at the pictures makes me gasp. I’m glad that’s crossed off your bucket list and hope you don’t do it again. 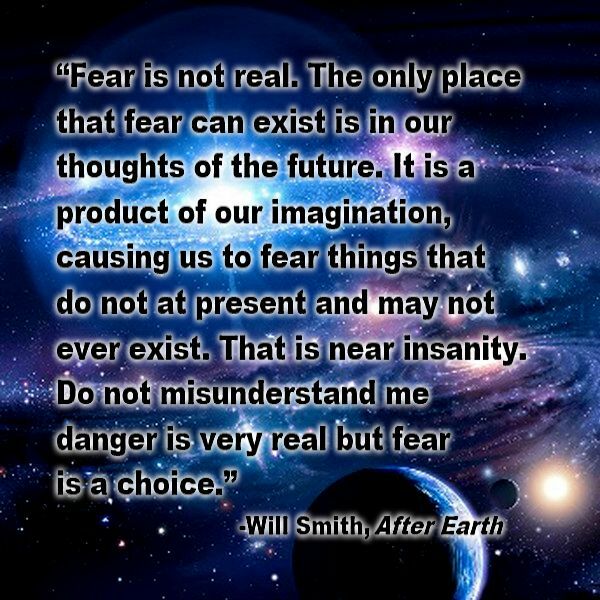 However,I appreciate your ability to overcome fear, especially the one of transferring and taking care of your dad. I enjoyed reading your point of view and imagine most caregivers at first feel the fear of that plunge and do it anyway. I can’t wait to hear the rest of the story next week! The advantage of research, planning and making arrangements for a vacation is the excitement of going helps me overcome my fears of getting there. 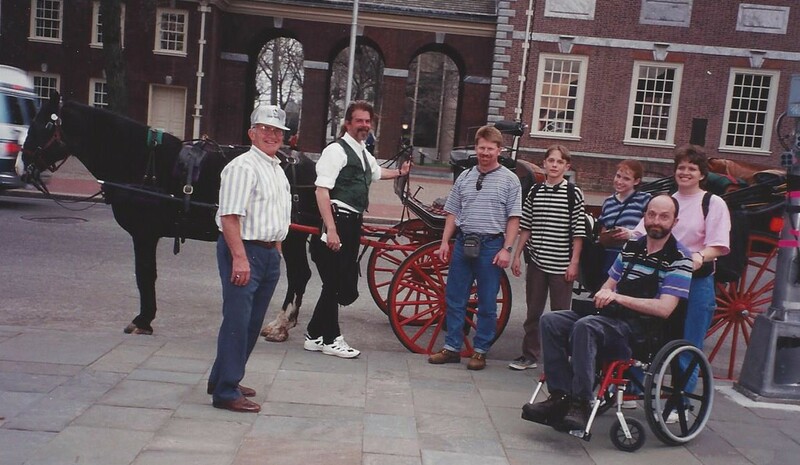 In my article, Giving Thanks to a U.S. History Teacher, I mentioned my fear of flying with Mark, who is totally reliant on a wheelchair since our car accident in 1991. Besides worrying about what would happen to the wheelchair during the flight, I couldn’t imagine how Mark, with limited control of his stiff, long legs could fit in an airplane seat with minimal leg room. We have a customized van with a ramp which enables Mark to stay in his wheelchair. This saves me from transferring him into a passenger seat, then disassembling leg rests, seat cushion and back before being able to collapse the wheelchair for the ride. We’ve done this routine many times and it becomes physically draining. Mark is a tall man (6’2” to be exact) and getting his legs into a vehicle is always a struggle. With our customized van he stays in his wheelchair and I secure it to the floor of the van. 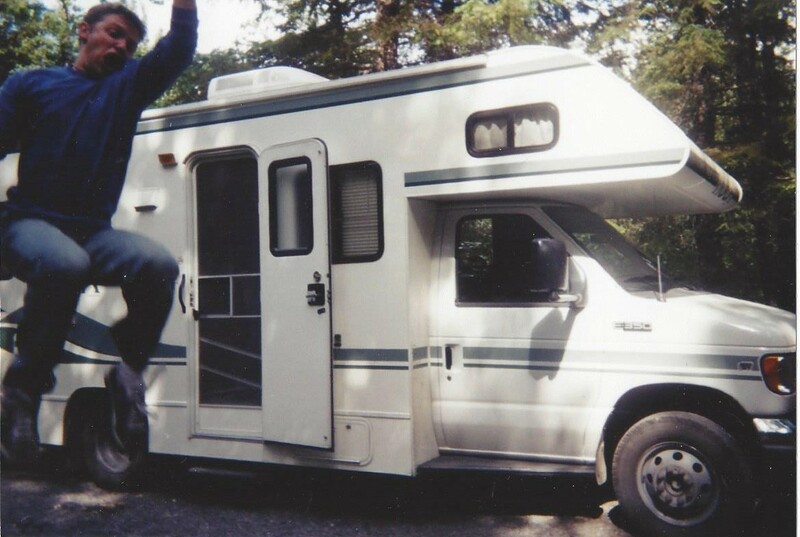 Traveling without our van is difficult, but when you fly somewhere and have to rent a van—you do it anyway for the sake of the trip. Mark’s daily care requires special equipment for the bed, shower and commode. The tools we use daily physically make it possible for me to take care of Mark. Traveling is always a challenge, but it increases when you require gear that doesn’t fit in the luggage. I have been asked if it ever crossed my mind to leave Mark home with extended family and just take the kids on vacation. The truth is I never did consider leaving Mark behind. Even if he wasn’t willing to go, I wouldn’t have felt comfortable leaving him with someone else. Mark loves outings and especially when it’s with family. He’s always game to try anything and has total trust we will take care of his needs wherever we are. We’ve taken him boating, rafting, on a tram ride, canoe, bus, carriage ride and on a train. None of it was easy and sometimes the ride was too rough for his body, but he always wanted to go. When strangers are lifting him out of his chair into an airplane seat or boat, he remarkably shows no sign of panic. He has good reason to fear because he doesn’t have any control of where he lands, but Mark stays focused on where he’s going instead of how he’s getting there and puts trust in whoever is helping him. No anxiety, he only expresses appreciation in all the efforts made in his behalf. This makes taking him everywhere a rewarding experience. Luckily, we have family and friends who willingly help us do activities which would be impossible to do without their assistance. These are people who want our lives to be enjoyable by sharing experiences most people take for granted. 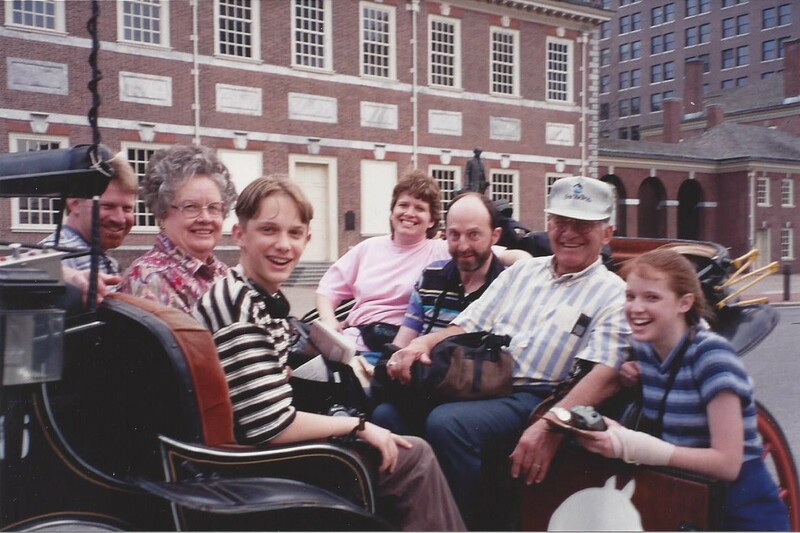 When we were in Philadelphia, Mark and I planned on staying back while the rest of the family took a carriage ride. My brother, Steve, wouldn’t stand for that. He insisted we lift Mark into the carriage and all take the ride together. I was more worried than Mark, but I followed his lead and stayed focused on the event which helped me overcome my fear. By focusing on where I wanted to go and not on what I feared, we have made many happy memories.